It’s horrible… but you can save it. 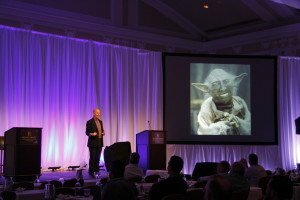 As a professional motivational speaker and comedian for over a quarter of a century I have strong opinions about the use of PowerPoint. And to point out the obvious…my perspective is as a presenter…not as an audience member. In my opinion is that 95% of you… No, make that 99% of you… abuse this powerful tool. And by abuse I mean absolutely, totally, and wildly fail. But the good news is that I have two very specific techniques that you can use to make your PowerPoint presentations not only better but quite good. The first technique is to use fewer words. And by fewer words I mean you need to eliminate 90 to 95% of the words on your current slides. Your audience, who ever they are, is there to see YOU. Not your slides. They are not interested in JUST the information. They want some information and YOU. This means that if you’re talking about your mission statement you are not going to include your entire mission statement on a slide. There will be no bullets. No paragraphs. Instead you’re going to put the word “Mission.” Then the audience will turn from the screen and look at YOU, listen to YOU, and learn from YOU. And all of that is very good. By the way, if you have bullets on your slide you have too many words. (I know that half of you reading this article just fainted. You’re ok. Get up. Shake it off. You’re fine.) Instead of the bullets put your headline with ONE word and then you’ll give the details — the stuff that would have been in the bullets — using the spoken word. You’re a presenter right? You can talk. And you should. Trust me: you’ll put the focus back on you. The second concrete technique you can use to improve your PowerPoint presentations is by eliminating most of your slides. Just like the number of words per slide, the number of slides per presentation has to be drastically reduced. Don’t cut out one or two slides. I’m asking you to cut out 70 or 80% of your sites. In my hour and a half motivational presentation I have exactly 20 slides. 90 minutes; 20 slides. Why? Because I’m a professional speaker; not a professional PowerPoint demonstrator. My clients hire me for me and my take on their world; they hire me because I have a unique voice and some great information; not for having a ton of slides. If you have so many slides that you are audience is just looking at your slides and not at you than you have clearly missed the point. Clearly your slides are more important than you are, and for my money that’s a huge mistake. Don’t forget that people want to see you. They want your personality, your uniqueness, and your ideas. They do not want to see endless bullets and long paragraphs on your slides; they want to see you. The main thing to remember as a presenter is to be reminded that our audiences don’t want us just for our knowledge or our information. They want us! If they want just our information they can read our website, read the article, or they can just read the stupid PowerPoint slides that we can email them. PowerPoint is a terrific tool. It can illustrate points, help your audience to understand where they are in your presentation, and even communicate information that is very difficult to communicate with just words. But it is nearly always used poorly. Horribly. Tragically. But not by you. Right? If you use it correctly… Which means don’t over use it… You’ll be well on your way to being a master presenter. 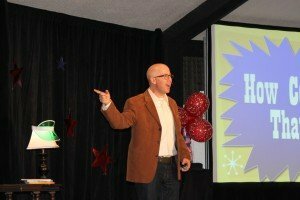 Brad Montgomery is a funny motivational speaker who speaks about happiness at work and how happiness can be used as a tool to increase profitability. (Oh, and he’s laugh-out-loud funny.) 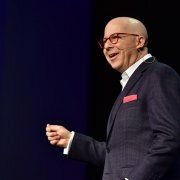 To learn more about Brad please visit his website https://www.bradmontgomery.com Or you can visit his blog https://www.bradmontgomery.com/blog.